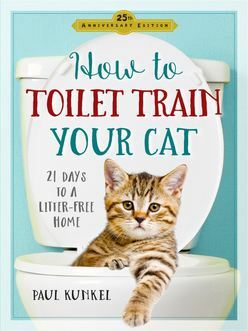 Paul Kunkel's foolproof, tried-and-true 21 day program teaches any litter-trained cat to use a toilet instead of a litter box. It doesn't require anything fancy-a toilet, a stack of magazines or newspapers, masking tape, plastic wrap, a supply of cat litter, and a litter box-and it's the perfect program for anyone who wants a happier, healthier cat. The program begins with you placing the litter box next to the toilet, and ends with your beloved cat using the toilet-just like any other member of the family. For life. Along the way, owners learn why toilet-training is beneficial to cats. In well-researched, totally updated, fact-filled text, Kunkel traces the history of this mysterious animal, and explains why many cats equate the smell of a litter box with danger; why the fragrances, deodorants, dyes, and disinfectants found in most litters are detrimental to your cat's well-being; and why the decision to transition to the toilet is one that will benefit both you and your cat. No more litter box, no more litter, no more cleaning-and no more smell! No more cat litter! The classic guide to toilet-training your cat (with 126,000 copies in print) is now updated for twenty-first century cats and their owners.